No matter how reliable your Raritan marine toilet is, over time regularly used pump parts wear, gaskets grow old and seals lose their ability to seal. That’s when it’s time to turn to Boatersland Marine for replacement parts to repair and maintain the Raritan marine toilet on your boat. The Raritan CH59 Shaft Seal for the Crown Head electric marine toilet, shown here, is just one of the many replacement parts and repair kits for Raritan marine heads that are in stock and available at discount prices at Boatersland Marine. 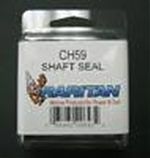 Save yourself time and money by buying the Raritan CH59 Shaft Seal for the Crown Head marine toilet at Boatersland Marine’s low prices and have it shipped conveniently to your door.